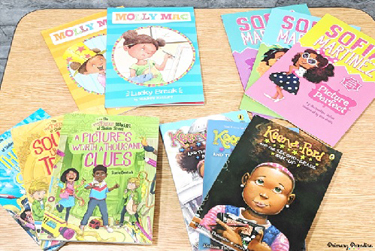 Even if the make-up of your classroom and school isn’t particularly diverse, it’s still so important to share a variety of diverse chapter books with our students that reflect our students and the overall population. My favorite moments in my classroom are always the times when I look around the room and all of my students have their nose in a different book. When I see each of my students engaged in reading (and I’m sure you feel like same) I know I’m doing something right as a teacher. As teachers, we strive to provide fiction and non-fiction books. Books on dinosaurs, plants and space, classics and new reads, chapter books, picture books… and so on. But, it’s so important to be sure our classroom libraries reflect the religions, genders, and ethnic make-up of both our classroom and society in general. Representation matters. Students want to see themselves in their books, and when they do, they are more likely to connect with the story and develop a love of reading. I absolutely love Steps to Literacy‘s Diverse and World Perspectives: Character Packs! These sets have been carefully and thoughtfully curated, by grade, by Steps to Literacy’s Pedagogy staff to enhance your existing classroom library. They are the perfect way to make sure you’re representing all students so your students can see themselves, their peers, and the vast unique and wonderful make up of people! It also allows them to learn about other culture’s food, holidays, and traditions. They specifically work with publishers who are committed to providing diverse titles like Capstone, Lee and Low, among several others. These sets have so much thought and research put into them, I have just loved diving in to these collections. Check out my full post where I introduce 4 of my favorite books from the series and give you a sneak peak of how they can help support your diverse classroom library.